We really hope to help people make the passage to Indian cooking with ease. 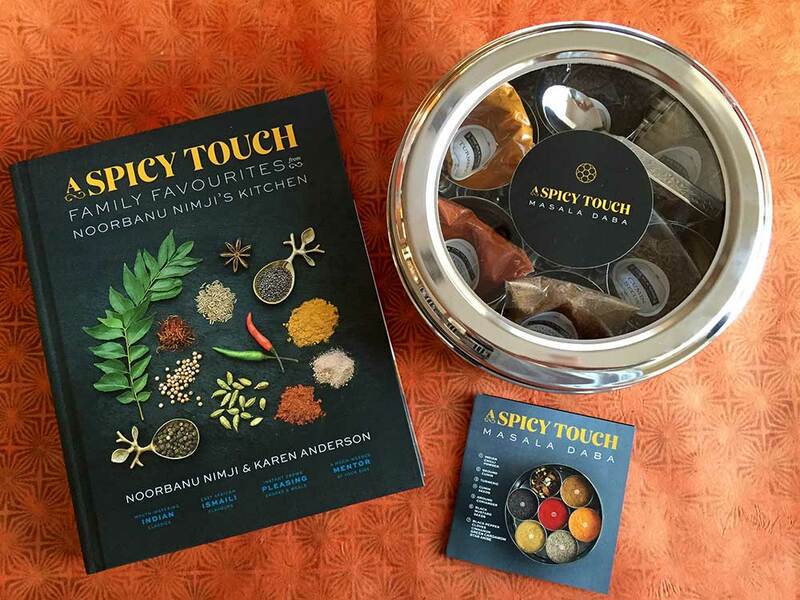 That’s what motivated us to spend nine years working on A Spicy Touch – Family Favourites from Noorbanu Nimji’s Kitchen. We believe that having a masala daba (spice box) loaded with the spices you are going to use most frequently in your Indian cooking will go along way in helping home cooks flow through our recipes. Our masala daba (spice box) is made of the highest quality stainless steel, with seven cylinders inside, a small spoon and a glass lid. We’ve partnered with The Silk Road Spice Merchants of Calgary to fill it with the freshest cumin, turmeric, Indian chilli powder, black mustard seeds, coriander, pepper, cardamom, cloves, star anise and Sri Lankan (true) cinnamon bark. You can stop by The Silk Road Spice Merchants at The Calgary Farmers’ Market, at the Inglewood location or in Edmonton. Or, you can order the masala daba to be delivered anywhere in North America through The Silk Road Spice Merchant’s beautiful website.